Salt has been added to bath water since ancient times. It is thought by many to cleanse and detoxify the body. Regardless of why people use bath salts, it is often the role of a handmade producer to make them attractive and aromatic to a buyer. Coloring salts is just one way to make them appealing to a buyer. 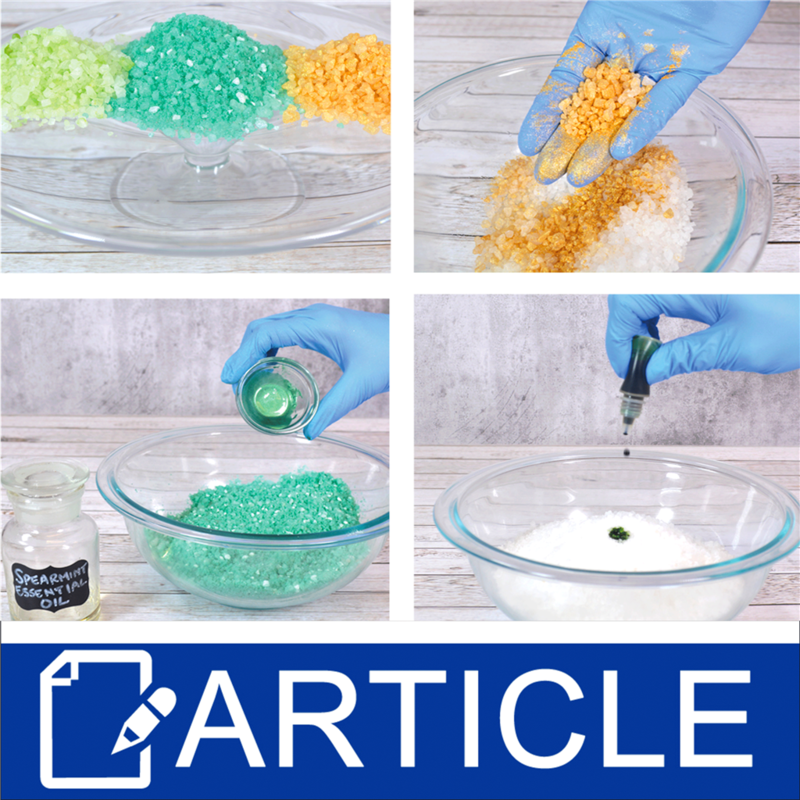 We have found that there are three tried and true ways to infuse color into handmade bath salts. Using Liquid Dyes: Apply a dye that is suspended in glycerin. 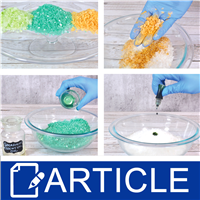 The glycerin base is very important because dyes in a water solution will be absorbed by the salt and likely dissolve the salt. Glycerin will microscopically sit on top of the salt. The fun part of using dyes is that they will color the bath water. It is for this reason we tend to shy away from using yellow dyes in bath salts. Using Oil Based Colors: Apply a healthy amount of fragrance oil to the bath salts (not soaking wet and not a few drops) and immediately toss the fragranced salts with a powdered color. The colors that work best are bath bomb colors, neon dyes and mica powders. Place the colored bath salts on a cookie sheet and leave open to the air for 1-3 days. This will allow them to completely dry before packaging. Using Mica Powder: Apply a fine mist of 90% rubbing alcohol to the salt and toss in a mica powder. As the rubbing alcohol evaporates the mica will dry on the salt and become attached to it quite nicely. The picture is an example of making gold nuggets with coarse Dead Sea salt and Crafter’s Choice 24 Karat Gold Mica Powder.